http://en.wikipedia.org/wiki/File:Flag_of_the_United_Nations.svg The United Nations, abbreviated UN in English - and not to be mistaken for the United States, i.e. the United States of America, abbreviated USA - is an international organization whose stated aims are facilitating cooperation in international law, international security, economic development, social progress, human rights, and achievement of world peace. The UN was founded in 1945 after World War II to replace the League of Nations, to stop wars between countries, and to provide a platform for dialogue. It contains multiple subsidiary organizations to carry out its missions. There are 193 member states, including every internationally recognised sovereign state in the world but Vatican City. The United Nations support Agenda21, the Plan of Action to help mankind make it beyond the year 2100. The United Nations are the organization behind the Millennium Development Goals. Last edited on 16:17, 24 July 2013. >349 views of this page. 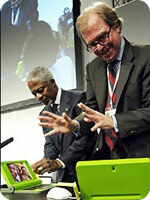 One Laptop per Child and the OLPC logos are trademarks of OLPC.